In 2000, the Advertising Research Foundation probably didn’t realize that their report about marketing’s ability, or lack thereof, to measure its value and contribution would initiate numerous studies, conferences, and products on the topic. 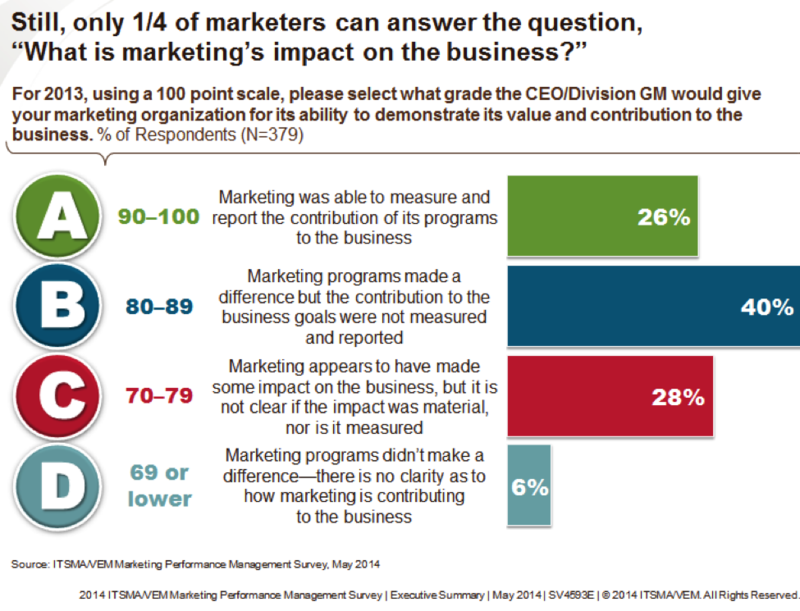 This year’s joint VEM/ITSMA Marketing Performance Management Survey* , which looks at how marketers and C level executives would rate marketing’s value, revealed that 85 percent of the nearly 400 study participants are seeing increased pressure for marketers to measure marketing’s value and contribution. A key component of the annual study looks at the comparison of the number of marketers earning an ‘A’ grade from the C-Suite for their ability to impact the business and measure their value with their counterparts who are falling short. The grades remained relatively consistent with prior years, with only a quarter of the marketers earning an ‘A’ for their ability to measure and report the contribution of marketing’s programs to the business. 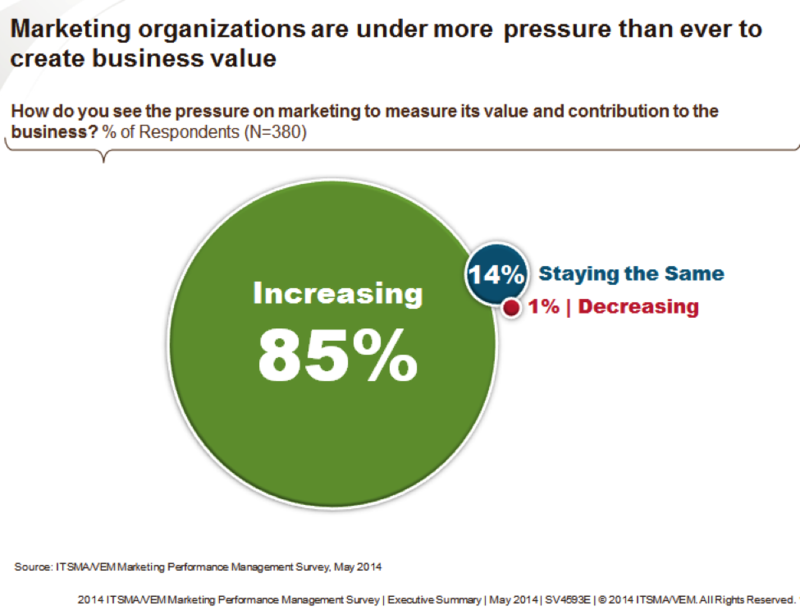 Marketing organizations that create value are proactive. The ‘A’ marketers hold themselves accountable for contributing to business outcomes even if senior leadership doesn’t. They believe it is their responsibility to identify, investigate, evaluate, recommend, and prioritize market and customer opportunities. These marketers implement continuous change to maximize the organization’s success, and enable it to stay abreast or ahead of market, customer, and competitor moves. ‘B’ and ‘C’ marketers don’t seem to do that, don’t ask the right questions, or don’t know how to show their value. According to the data, organizations that are performing well when it comes to customer value and business growth, are those where the marketers excel at performance management. ‘A’ marketers prioritize performance management, establish a clear roadmap for performance improvement, and focus on aligning marketing to the business not just sales. They have regular two-way dialogue with senior leadership and are motivated to select and report on the metrics that matter most. Join the conversation with VisionEdge Marketing and ITSMA in our webinar, The Link Between Performance Management and Value Creation, Tuesday, June 17th, from 10:00-11:00am CST. *VEM has been conducting the survey for 13 years. ITSMA has co-sponsored the survey for the past three years. This entry was posted in Uncategorized and tagged Business Strategy, CEO, CFO, CMO, marketing accountability, marketing alignment, marketing analytics, marketing and sales, marketing automation, marketing data, Marketing Effectiveness, marketing management, marketing measurement, marketing metrics, Marketing Performance, marketing performance management, marketing performance measurement, marketing plan, marketing processes. Free Benchmarking–Does Your Marketing Measure Up? Here’s something we know after conducting the marketing performance measurement and management study since 2001: Best-in-Class marketers are relentless when it comes to continuous improvement. How do they know how they stack up? They regularly audit and benchmark. We know this can be expensive—even a small benchmarking study for marketing typically takes at least $20,000. With marketing budgets still feeling the crunch, it makes sense to be a bit more creative when it comes to benchmarking. And that’s where our annual marketing performance study comes in! There are plenty of studies out there, and only you can decide which ones are worth your time. As a marketer you could probably complete a study every day, but if you are feeling the pressure to prove the value of your marketing, then this survey is for you. With 13 years under its belt and participation from marketing professionals and executives from around the world, in every industry and of all size organizations, we are able to provide a solid view into what Best-in-Class marketers do better and differently when it comes to measuring marketing’s contribution and value. Given how hard you’re working every day, it’s frustrating when budgets are slashed and programs are terminated. You know Marketing is highly valuable to the business, but can you prove it? If you can, you may be among the ranks of the Best-in-Class—those marketers who have made marketing relevant to the C-Suite! If you can’t, it’s probably time to make some changes. Find out how your organization stacks up against the Best-in-Class. Give 15 minutes of your time to participate in the 13th Annual MPM Survey and save the benchmarking dollars. What does the survey benchmark? The focus of the survey is Marketing Alignment, Accountability, Analytics, Operations, and Performance Management capabilities. Complete the survey, share the link with your marketing colleagues and leadership team, and use the survey and the upcoming results to spark internal dialogue on the state of your marketing! This entry was posted in Uncategorized and tagged Best Practices, CEO, CFO, COO, marketing accountability, marketing alignment, marketing analytics, marketing data, marketing management, marketing measurement, marketing operations, Marketing Performance, marketing performance management, marketing performance measurement, measuring marketing. If the metric is measuring how well you squeeze out waste or cost or measure maximum output for input, it’s most likely an efficiency metric. Marketing spend, ROI, and cost/per lead, lead/rep are examples of efficiency metrics. If the metric is measuring how well you are contributing to or producing a desired result, it is most likely an effectiveness metric. Share of preference, share of wallet, products/customers are examples of effectiveness metrics. As we have learned from over a decade of research on marketing metrics, many marketers are doing a good job of establishing, monitoring, and managing efficiency metrics and not as good of a job with developing, measuring, and managing effectiveness metrics. This propensity to focus on efficiency metrics ultimately creates a problem for marketing. You can be improving efficiency, which has nothing to do with whether or not what you are currently doing is the right thing to do, while not actually becoming less effective. Effectiveness is about achieving the right result, or being on the right path. When we are positively impacting and contributing to the right result, then we earn our right to participate in strategic conversations. It may be easier to identify, track and manage efficiency metrics but that may not be the only reason we see more efficiency related metrics. Many people assume that they are on the right track so if and when there is a problem, they address it by trying to make the process more efficient without questioning whether they are going in the right direction. But if you are going in the wrong direction, becoming more efficient will actually make the problem worse. For example, let’s say your company wants to grow its revenue by some amount. As a marketer, you believe you can affect this by producing some additional business from existing customers. So, you are monitoring and improving the inquiries, deals, cost per new deal, etc. The company is growing but its market share is declining. Why, because the growth opportunity is really outside the existing customer segment. So while marketing is becoming more and more efficient at generating business from existing customers, the company’s market share is actually declining and the competitors are achieving greater market dominance. What’s really important is effectiveness. In the end, it doesn’t matter if your business is spending the least amount possible or your demand-generation initiatives are streamlined. What matters is whether marketing is solving the right problems and moving the right business needles. Before you start thinking about how to improve your efficiency, step back and think about how marketing is expected to move the needle and measure its effectiveness. Don’t misunderstand, efficiency is extremely important and you will need efficiency metrics. Improving efficiency can make a difference, but only if you’re on the right path. And the only way to know that is to have effectiveness metrics in place as well. Efficiency is important, but powerless without effectiveness. Effectiveness opens the door for efficiency. This entry was posted in Marketing Effectiveness, Marketing Measurement, Marketing Performance and tagged CEO, CMO, Marketing Effectiveness, Marketing Efficiency, marketing measurement, marketing metrics, Marketing Performance, marketing performance management, marketing performance measurement, marketing strategy. As you are finalizing your plans for 2014, it is an excellent time to revisit your approach to strategy. Strategy is about defining and setting the long-term direction for your organization. Marketing as one of the primary external-facing entities (sales is another) within an organization plays a central role in strategy development and execution. During the past few years, many companies have focused heavily on internal processes, looking for a way to reduce costs and improve productivity. While this is essential to survival and driving short-term earnings, it doesn’t help a company address shifts in the market, new technologies, new channels or the entrance of new competitors. This is the domain of strategy, and successful strategies leverage an outside-in approach, which takes seeing your customers as assets. If you want to take an outside-in approach to strategy you must be willing to continuously invest in learning about and from your customers and to translate this knowledge into initiatives that will enable you to gain a competitive advantage, improve your market position and ultimately your shareholder value. We hope you will check out George Day and Christine Moorman’s book, Strategy from the Outside-In: Profiting from Customer Value, which discusses taking an outside-in vs. an inside-out approach to strategy. Inside-out thinking begins with more traditional questions such as “what are we good at,” “what are our capabilities,” “what are our products,” and so forth, and can make a company rather myopic. The book explores how organizations that take a customer-centric view — looking at everything the company does through the customers’ eyes — focus on creating and keeping customers by delivering exceptional customer value. In their book, the authors remind us that when companies “hunker down, cut R&D, slow innovation, no longer experiment,” and put internal issues above serving customers, they are putting their survival at risk. This is all part of the inside-out thinking. Their work found that “outside in” companies perform better because they immerse themselves in the market, doing more experimentation in order to gain market insight and draw actionable ideas. How do you know whether you are an inside-out company? If you are continually surprised by bad results, seem out of touch with who your customers are and what value you are delivering to them, the entrance of a new competitor or the emergence of a new product category, you may be falling into the inside-out trap. Outside-in companies depend on marketing to help them be customer-centric and to increase the direct dialogue with customers in order to see and adapt to patterns sooner. This responsibility as well as finding growth opportunities and positioning the organization for the future falls to the CMO. 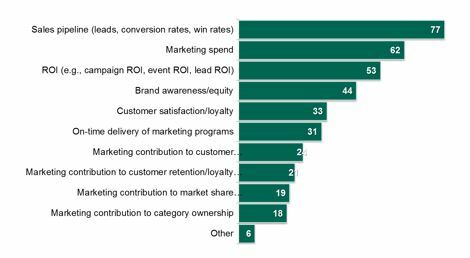 Successful CMOs are passionate advocates for customer value and build strong relationships with R&D and sales. By taking an outside-in approach, marketing can develop strategies that will improve its ability to attract, keep and grow the value of customers, thereby improving its effectiveness and value — critical components of marketing performance. As you build your marketing strategy and offer counsel to your leadership team, we hope you are taking an outside-in approach. This entry was posted in Uncategorized and tagged marketing analytics, marketing data, Marketing Performance, marketing plan, marketing strategy, Marketing Value. This year, numerous studies of the marketing discipline and numerous articles highlighted the challenge and need for marketing to capture, manage, synthesize and leverage data and analytics. Marketing organizations around the world want to become more data-driven, but the explosion and rapidly growing volume of data as well as the lack of effective tools make this difficult. In the meantime, they are revamping their organizational lineup, adding more analytical talent and capabilities that enable them to boil oceans of data and produce mountains of reports. Access to this information and refined analytical and process skills create an opportunity for marketers to generate business-relevant insights. Having the necessary skills and technological infrastructure are becoming table stakes to successfully compete and serve customers. These capabilities are evolving into the building blocks of every marketing organization’s foundation. Today, marketing leaders use data, analytics, metrics, and modeling to tackle point problem and to enable organizational change. To be effective change agents, marketing leaders need to move from being a blocking and tackling organization to taking a more holistic approach — one that integrates analytical, process, strategy, planning, and performance management expertise. Being a change agent is a noble aspiration, but what does that entail? Change agents are catalysts. A successful change agent improves the organization’s ability to achieve a higher degree of output. When acting as a change agent, marketing leads the creation of a vision of what could or should be. Marketers then identify what it takes to realize this vision and go about amending or replacing strategies, procedures, and processes that are obstacles to achieving the vision. We operate on two planes — one where the organization currently is, and the other being the ideal state. Since marketing should be the antenna for the organization — gathering and interpreting the signals — we are in a better position to act as change agents. The business environment is always changing, and therefore, the company that can create, manage and master change has the greatest potential to thrive. Being a change agent means more than just coming up with a brilliant idea — it is about bringing the idea to life and engaging the rest of the organization. Creating, managing and mastering change is a skill. The skills we have in marketing to connect and engage with external customers and prospects are the same skills we need to connect with and engage people within the organization. That’s what gives marketers an advantage as change agents. The steps we use to impact and drive change externally also enable marketing to impact and drive change internally. 1. Link change explicitly and tightly to real performance outcomes. Change is not for the sake of change; change should improve business performance. The result of change should be concrete, specific, quantifiable, business outcomes. 2. Develop concrete initiatives that support the outcomes and focus on what it will take for these initiatives to affect the organization’s operation in a positive way. 3. Include the human dimension in your calculations. People do what people do. They embrace, they resist, they obstruct, and they rise to the occasion. Listen closely. People dodge drafts. Find ways to enroll people into the process. 4. Develop and market the message. When we sell to different market groups, we develop appropriate campaigns. Employ this approach inside. Segment your internal markets and tailor the message accordingly. Leverage both the informal and formal networks. 5. Disruption is an important part of the process. Being a change agent means you’re going to discomfit people around you. You’re going to interrupt the “way we do things.” As change agents you must be able to step outside of your own comfort zone if you want to take people outside of theirs. Key to being a change agent is producing and keeping a healthy tension alive in the organization. Here’s an important point to remember about being a change agent — the first person who must change is you. A change agent models the way. We must live the vision we see and the behavior it requires if we want others to do so. The rest of the team will be watching us. We must develop the skills and techniques to change how we work if we’re going to help others acquire the skills and techniques to change how they work. Being on the front line enables us to capture, manage, and synthesize market and customer data sooner and faster. As a result we are ideally situated to use analytics, metrics, and process to act as organizational change agents. This entry was posted in Uncategorized and tagged marketing analytics, marketing data, marketing management, marketing metrics, marketing operations, Marketing Performance, marketing performance management, Marketing Plans, marketing processes, marketing strategy. During periods of change and uncertainty, it makes sense that companies work hard to understand the implications of the results for several scenarios. Scenario analysis is a good exercise for strategic planning at any time. Most polls are showing a close election and suggest that we will continue to live under a divided government, accompanied by discord, debates and delay. It might be heartening to know that since 1947 the president’s political party has switched back and forth eight times and the control of Congress has reversed even more frequently. Even with these changes in political power, the economy grew 85 percent of the time. Since 1982 the U.S. economy grew 90 percent of the time. In fact, the economy has expanded at an annual average rate of 6.6 percent, despite periodic recessions. 1. Be Strategic: Choose the best strategy that will generate value for your company and industry. 2. Pick your Bets: Bet on a strategy tailored to your current situation designed to achieve your organization’s customer and market outcomes. 3. Follow the Boy Scout Motto – Be prepared: Don’t wait until the end of the year to prepare for calendar year 2014. This will only put your organization behind today’s global competition. 4. Semper Paratus– (Always Ready): You are more likely to achieve next year’s performance targets if you have a plan ready to implement when the new fiscal year begins. 5. Develop your plan and make quality strategic marketing investments aimed at moving the needles for the business. While change and uncertainty may make planning more difficult, they also make it more essential. A good plan takes into the account the extra risk the business may face. In times of uncertainty it is important to step back and identify risks, consider scenarios, and continue to innovate. Rather than using the impending political climate as an excuse for “battening down the hatches” or to taking a “wait and see” position, the best course of action is to maintain a long term perspective designed to manage potential risks and move your organization forward. This entry was posted in Uncategorized and tagged economics, improving marketing, Laura Patterson, Marketing, Marketing Performance, marketing performance management, marketing performance measurement, marketing plan, politics, proving marketing, VisionEdge Marketing.